Every blogger is different. Every blogger has their own style and things they like to blog about. I love the variety of posts I get my blog reader: photography, crafting, baking, travel, teaching, parenting, pregnancy, personal struggles, pregnancy, you name it. Every now and then I find some new fun blogs that interest me. Whether it's something we have in common, or just the people that are behind the blog. Sometimes it's good to read something fresh and branch out a bit. I used to twitter and if you tweet then you probably know of a thing called "Follow Friday". I liked the concept of sharing people you think others will like following, so I thought I would bring it to my blog. Here are three new blogs I've discovered and want to highlight! Hearts and Scars I can already tell Chelsea is such a sincere person! She's strong and inspirational and I only just found her blog! I love her amazing photography. Don't you just love her blog header above!! She captures the best color in her photos! I adore her blog! Tails to Tell This is Lindsay. She's an animal and art lover! She's an amazing painter and shares some yummy recipes and cute tutorials! Recently, she showed us how she creates her leopard print design for her pedicure! She lives in beautiful Hawaii (I'm jealous!!) She seems like a real sweetheart I think you would like her! 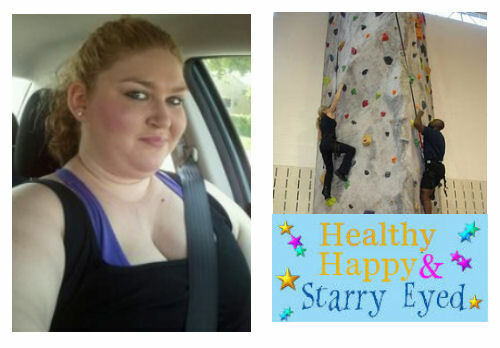 Healthy, Happy & Starry Eyed Meet Sarah. Yep, she's my little sister! She recently started a blog about her journey to a healthier self. We all know how hard that can be, and how we all could use some people cheering us on. She posts about what inspires her, her workout goals, and new healthy foods she discovers. She's awesome! Hop on over to those blogs and check them out. Each of these lovely ladies has a lot to offer! Thanks for including me, and thanks for introducing me to a couple new blogs! :) I love finding neat new things to read.